The crescent, almost jellybean, shaped possum pellets have slightly pointy-ends, which is often easier to see in separate pellets than in clumped pellets. These pellets are not fresh as they have lost the moist sheen typical of fresh pellets and the characteristic greenish tinge has darkened. 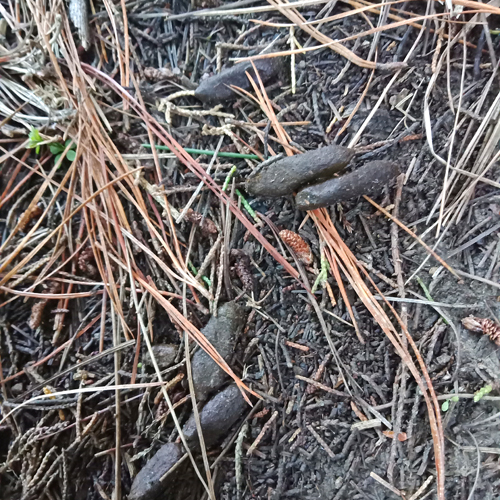 Possum pellets are usually about 15-30 mm long and 5-14 mm wide. The pine needles and the cone-like pollen strobili help to give scale (the strobili typically ranging from 7 - 17 mm long). Photograph: by Matt Downer, taken in Grampian Reserve, Nelson.